Alpha Piano and Porsche Design have teamed up to produce this ultra sleek, futuristic piano. Though technically an electric keyboard, it has little in common aesthetically with the clunky plastic boards that you are likely used to. 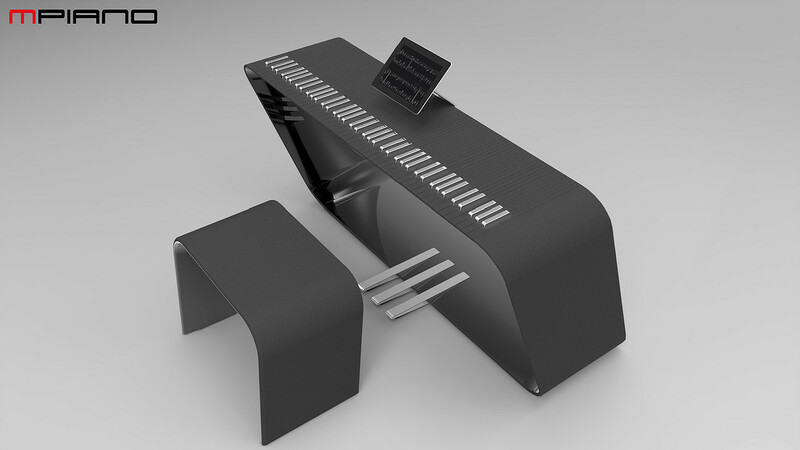 The mPiano has already won the Red Dot Award, an international award for high design quality. Undoubtedly the appearance is part of why Lady Gaga, always cultivating a new and unusual look, has chosen to preorder one of these pianos for an upcoming tour. But the mPiano is more than a neat bit of modernist design. The ‘m’ stands for ‘mechatronic,’ and beneath each key are adjustable actuators that allow the user to customize the resistance and perceived weight of the keys, making for a unique and personalized playing experience. The keys are also touch sensitive and polyphonic; sliding a finger up and down a key will alter the vibrato and change the volume. The piano will be accompanied by an app designed by Alpha Piano that will allow the user to wirelessly change parameters like pitch and resistance. Hypothetically, the mPiano can be made to ‘feel’ like anything from a massive church organ to a harpsichord. Currently there is no word on the price of the mPiano, but interested buyers should note that the last piano from Porsche Design cost $272,699.